I was watching CNBC, and old Boone Pickens was on there with his dire forecasts of the US oil situation. 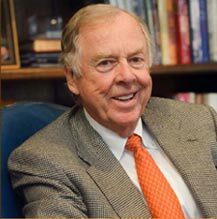 What I like about Boone Pickens is that he tells it like it is... the world demand for oil is 87 million barrels of oil a day and we are only producing 85 million barrels a day (mbpd). The reason the price of oil is so high is not because of the greedy Arabs or Hugo Chavez, or OPEC, or Hurricane Katrina, etc, etc, etc. No... it's simple supply and demand. Just like I have been telling you for the past few years. The supply is stuck at 85 mbpd and is NOT going to go up. It will probably stay the same for a few years and then start to go down. The 87 mbpd "demand" figure is not going to go down anytime in the near future either. It is probably going to go up. Therefore the price of oil is going to go up too. The billionaire Boone Pickens knows what he is talking about too. He has been around a while. He is one of the original oil wildcatters and has made millions in his Mesa Petroleum company. If anybody knows what is going on with the price of oil, it's Boone Pickens. I have often speculated myself on what is going to replace the huge amount of oil we use in the US every day. And this is a very important question. After all, the answer to this question will determine how you plan for your future. Right now, the figure is at 20.2 million barrels per day. That's just in the US! Now, let's look at ethanol... we are producing about 17 million gallons a day. There are 42 gallons of oil in a barrel, so we are using about 848 million gallons of oil per day. Of course, not all that is gasoline - it's diesel, kerosene, jet fuel, heating oil, etc. But, as you can see, 17 million gallons a day of ethanol is just a drop in the bucket compared to what we need if we are to replace fossil fuels. And the biodiesel production figure is even smaller at about 1.2 million gallons per day in 2007. Boone Pickens knows all this and calls ethanol a "joke". He says natural gas is the next great fuel to power our nation. And he is putting his money where his mouth is. His plan is to wean the electricity producers off of natural gas so he can fuel our transportation system with natural gas. He is going to use a massive wind turbine farm to generate a massive amount of electricity that would otherwise be generated with natural gas. He will then use the freed up natural gas to fuel America's transportation industry thus reducing our dependence on imported oil by 20% in short order. He plans to have 4000 MW of wind turbine electricity capacity in his Pampa, TX wind farm by 2015. This will make it the largest, by far, wind farm in the world. CNBC calls Boone Pickens the "Oracle of Oil". And his plan sounds solid to me. After all, natural gas is a clean fuel as it emits up to 95% less pollution than gas or diesel engines. Boone says, "You find an oilfield, it peaks and starts declining, and you've got to find another one to replace it. With wind, there's no decline curve". And, from what I understand, most of the natural gas we use in the US is produced right here in America. As you all know, our little spike in alternative fuel production over the past year has caused some pretty serious secondary problems... rising food prices, food shortages, hunger, clear cutting rain forests to plant biofuel crops, and more. Maybe it's time to take another look at "green" alternative fuels and rethink our future. I have always promoted jatropha for biodiesel. It is not edible and can be grown in semi-arid places where food crops will not grow. Of course used fry oil is good too "if" you can get it these days. I never did like ethanol because of the very low EROEI (energy returned for energy invested). See my Feb 2006 newsletter at http://www.electricitybook.com/e85-ethanol/ - I really don't like the idea of putting our food into our gas tanks. There are too many people who will go to bed hungry tonight. Many thousands of people will die every day just because they do not have enough food to eat. We simply can not replace our food crops with fuel crops no matter how much more profitable it is. I like Boone Picken's plan - what about you? You can install your own homemade wind turbine in your back yard. Just click HERE for all the details.